This is a guest post by Jeanne Zaino, who is Professor of Political Science & International Studies at Iona College. Senator Frank Lautenberg (D-NJ) will likely be remembered for the work he did on a wide range of policy issues from transportation and public health to affordable housing, the environment, and refugees. What is sometimes not recognized is that as a long-standing member of the Senate’s Committee on Commerce, Science, and Transportation, Sen. Lautenberg also fought to retain the National Science Foundations (NSF’s) support for all the sciences. At a time when public funding for the social, behavioral, and economic (SBE) sciences are under attack, just a few months after the Senate voted to restrict funding for political science research and weeks after a House Subcommittee Chair requested the NSF turn over information about reviewers comments, it is important that we remember Sen. Lautenberg for his work in this area. One notable example occurred in May 2006. At that time the Commerce, Science, and Transportation Committee was considering the American Innovation and Competitiveness Act of 2006 (S.2802). The bill included a provision directing the NSF to prioritize grants that “make contributions in physical and natural sciences, technology, engineering and mathematics, and other research that underpins these areas.” Another member of the Committee, Sen. Kay Bailey Hutchison (R-TX), was upset by the last phrase because she felt it left too much room for the agency to support projects that don’t enhance America’s competitiveness, most notably the SBE sciences. As a result she offered an amendment designed to close this loophole and in doing so attempted to exclude funding for both the natural and social sciences. This wasn’t the first time Hutchison had expressed dismay regarding the NSF’s funding of the SBE sciences. During an address at the Lasker Medical Research Awards Luncheon a few months earlier she questioned the wisdom of the NSF’s spending on social science research. She later cited specific grants she found questionable and asked whether this type of research could be funded elsewhere? She also made it clear that while she supported doubling the NSF’s budget, she did not believe any of those funds should go towards the social sciences. As she later made clear, Hutchison was not particularly happy with the compromise and continued to believe that the NSF shouldn’t support most SBE projects. Nevertheless, as a result of Lautenberg’s efforts, she joined with the rest of the committee in voting the bill out unanimously. Hutchison’s arguments against SBE funding are eerily reminiscent of those being made today by Sen. Tom Coburn (R-OK), Rep. Lamar Smith (R-TX), and others. The difference is, unlike Hutchison, when Coburn proposed an amendment in March limiting funding for political research he was successful. And while NSF Acting Director Marrett rebuffed Smith’s recent request for reviewer comments and other information, we still don’t know what the ultimate outcome of that situation will be. So even though Sen. Lautenberg is not usually remembered for his efforts to protect NSF funding for all sciences, now is a particularly good time to recall this important part of his legacy. We welcome this guest post from Stephen Benedict Dyson. He has done research on Thatcher and, incidentally, grew up in Great Britain. The death of Margaret Thatcher has prompted much reflection on her policies and her personality. One way to think about Thatcher is to consider her in light of the recurrent debate about structural forces and individual agency as shapers of political outcomes. Thatcher was certainly a distinctive presence, but did she make the political weather, or would anyone in her position have done as she did? If Thatcher as prime minister was just responding to the incentives in her political environment from 1979-1990, she was less interesting as an individual than many of the tributes suggest. If she shaped her environment in ways determined by her personality and individual beliefs, she becomes a more important focus of our attention. Circumstances were certainly ripe for change when Thatcher came to power. The UK economy was rotten with stagnant growth and high unemployment. James Callaghan’s Labour government had been unable to reach wage settlements with its union allies, leading to widespread industrial action. Thatcher’s own Conservative Party was middle-of-the-road ideologically, accepting the broad outlines of the British postwar consensus: nationalized industries, full employment policies, strong unions, and a big welfare state. Her party was dominated by patrician proponents of One Nation conservatism. Any prime minister in Thatcher’s place would have had strong incentives to change the political direction of the country, to revivify the economy and revisit the center-left consensus. Yet would anyone have gone so far as she did, so quickly? We forget that Thatcher was an embattled prime minister during much of her first term, leading a small group of believers in free market, monetarist policies, isolated even within her cabinet. Much of her own side, let alone the opposition, believed that her economic policies, developed outside of civil service and party structures by her personal advisor Alan Walters, were responsible for the deep recession of 1980-81. Would another prime minister have loosened the money supply and sought to reflate the economy? Thatcher would entertain no such thoughts. Opposition to her economic policies would come to a violent head with the Miners’ strikes of 1984-85, stemming from the controversial closure or privatization of the state-run industries she had inherited. To structuralists, these were the necessary birth pangs of a post-industrial Britain; to students of agency, the speed and scope of Thatcher’s reforms – and the attendant social dislocation – were redolent of her aggressive personality and rejection of the status quo. Striking these Churchillian tones seemed, in 1982, discordant with a post-imperial Britain in decline, yet they were consonant with Thatcher’s personality. Her rhetoric on British greatness became so hawkish that the Chinese leader Deng Xiaoping was seriously concerned that she was contemplating the forcible retention of Hong Kong. Her cabinet colleagues later told biographer John Campbell that, in their opinion, no one else in the prime minister’s chair at that point in time would have launched a military expedition to recapture the islands. Thatcher and Reagan made a shared journey in moving from the hardest of anti-communist lines to an embrace of new Soviet leader Mikhail Gorbachev. Here is surely definitive evidence of structure trumping agency: the incentive to peaceably end the cold war overwhelming the idiosyncratic anti-Soviet beliefs of the U.S. and UK leaders. Yet, there was a good dose of personality in Thatcher and Reagan’s shared change of mind. Those who categorize the world into definitive, clear-cut boxes such as “friend” and “enemy” respond in a distinctive way to radical changes of circumstance. Having achieved cognitive closure on an issue, they are capable of ignoring lots of information for a long period of time in favor of persisting with their settled images. Yet, once they pay attention to a change, they can rapidly reverse their views. According to her advisor George Urban, Thatcher had an instant intuition about Gorbachev: “I immediately hit it off with him.” She passed on her judgment to Reagan: “We can do business with him.” Both Thatcher and Reagan rebranded Gorbachev from “enemy” to “friend” with greater cognitive ease than the more complex thinker George H.W. Bush, who initiated a pause in cold war reconciliation after succeeding Reagan as president. Yet it was a foreign affairs issue upon which Thatcher did not change her beliefs that brought about her political demise. Her view on European integration was always clear: “Europe” was foreign, a bloated bureaucracy pushing side-payments to special interests such as uncompetitive continental farmers. As the European Community moved toward full monetary union and ever increasing political integration, Thatcher become more resolute in her determination to retain, as she saw it, British independence and sovereignty. Her political problem was that a huge part of her own party, including many of the most senior members of the cabinet, did not share her views. Her powerful Finance Minister, Nigel Lawson, and Foreign Secretary, Geoffrey Howe, threatened to resign unless she took Britain into the “Exchange Rate Mechanism” – a precursor to the single European currency. Her extraordinarily belligerent performances at European summits and in parliament during this period, bellowing “No! No! No!” when responding to questioning on the issue, exposed fatal splits in her government. The Europe controversies were followed by the introduction of a deeply unpopular new taxation scheme, her characteristic refusal to change course in the face of public and political opposition, and the eruption of street riots in London. She was removed by cabinet coup in November 1990. “Treachery with a smile on its face,” she called it. Thatcher’s political legacy was profound. Her successor, John Major, proved unable to seal the Conservative Party fissure over Europe, nursing his battered and exhausted party through a weak single-term in office followed by thirteen years out of power. Tony Blair, a media-savvy reformer who entered parliament in one of the few victories by a Labour party candidate in the 1983 election, saw Thatcher in full pomp as the model of what an assertive prime minister could achieve. He shifted the Labour party to the center, consolidating a new post-Thatcher consensus well to the right of the pre-Thatcher mode. His foreign policy was characterized by a definitive, assertive worldview reminiscent of the Iron Lady. Lacking the ability to re-run the years 1979-1990 with a different person as prime minister, a weighting of the impact on history of Thatcher’s personality versus the circumstances she faced can be a matter only of thoughtful speculation. As we reflect upon the Thatcher era, and larger questions of structure and agency in political life, we should continue to ask what would have been the same, and what would have been different, if someone else had been prime minister during that long decade. Breaking news from Britain brings word of the death of former Prime Minister (later Baroness) Margaret Thatcher at age 87. Battles over her legacy are already being renewed—see ongoing coverage in the UK from the right, from The Telegraph, and from the left, from The Guardian. Hugo Chavez was, to put it mildly, no fan of U.S. foreign policy. One of his favored outlets to express those views was the United Nations General Assembly; most famously his 2006 speech in which he called George W. Bush the devil. 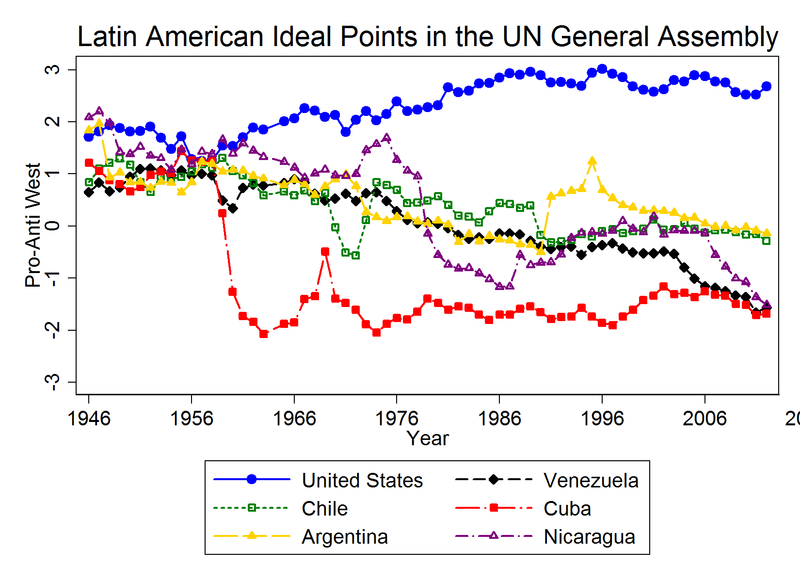 Below is a graph that depicts the “dynamic ideal point estimates” of the United States, Venezuela, and some other Latin America states based on their vote choices in the UN General Assembly. It is based on a paper Michael Bailey, Anton Strezhnev and I will present at the upcoming MidWest political science conference (sorry not done yet). Here is a brief illustration that may help with the methodology (or see this article). Our goal is to provide historically comparable estimates of the positions of states on a dimension that captures conflict over acceptance of the Western U.S. led liberal order. In the early days of the UN, Latin American states were reliable allies of the U.S. Most Latin America states gradually moved away from the U.S. with the exception of Cuba, which shifted abruptly after its revolution. Hugo Chavez moved very quickly towards Cuba’s ideal point after taking power in 1998. He was joined there by Nicaragua (after the Sandinista came to power) and also Bolivia (not shown). This has created a somewhat bi-polar situation within Latin America; with some countries (like Argentina and Chile) quite a bit closer to the U.S. than others. Historically, Latin American countries have often voted together (with the exception of Cuba). This is all fairly well-known but I thought this graph captures the dynamics well and puts Chavez in some historical and comparative context. For those interested: I plot the same graph below the fold with the traditional way of computing voting similarities between countries (S-scores or simple percentages of agreement with the U.S.). You’ll see that those obscure some important differences among Latin American countries.